Some time ago I ordered a bunch of 2/26 wool, not really knowing what I was getting, but it’s been interesting to work with. 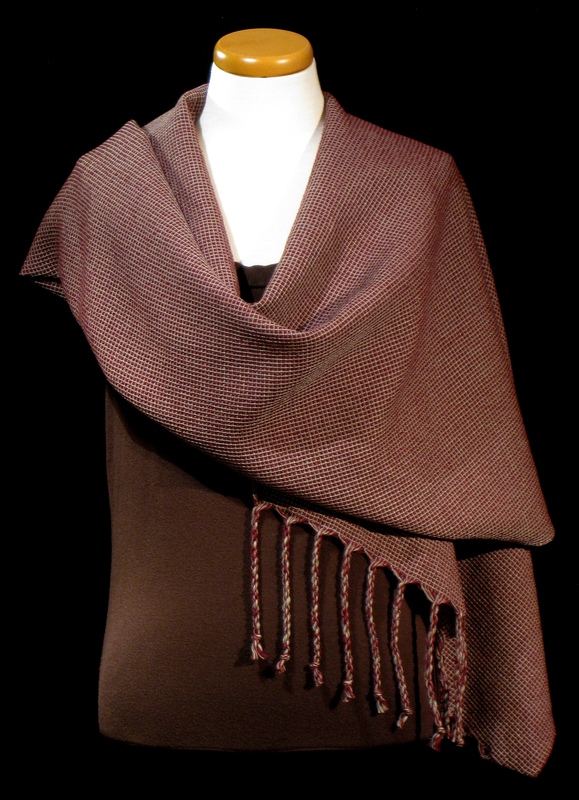 I had made a twill shawl out of it (SH003 in green), which was nice, but so flat. I wanted to see if I could add a little texture, so I tried a 4-shaft waffle weave, threading and weaving 3 threads burgundy, 3 threads light sage (which looks grey in this context). It did full up a bit in the wet finishing, and has a good drape but is a little stiff. I think there’s more for me to learn re: wet finishing as well. Surprisingly, there is some color difference between the two sides, but it’s subtle. I’m pleased with it. 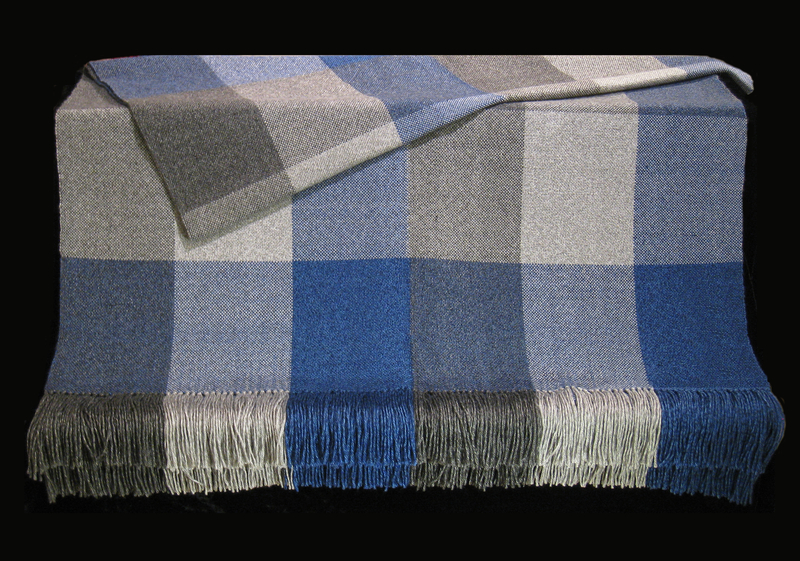 Double-width Blanket – oh my! So, I’ve wanted to weave a blanket since before I got my floor loom. For my first try, I used acrylic – Lion Heartland – for easy care, and I also liked the colors. There was a lot of planning to figure out how to do the plaid so it was interesting but not too complicated. 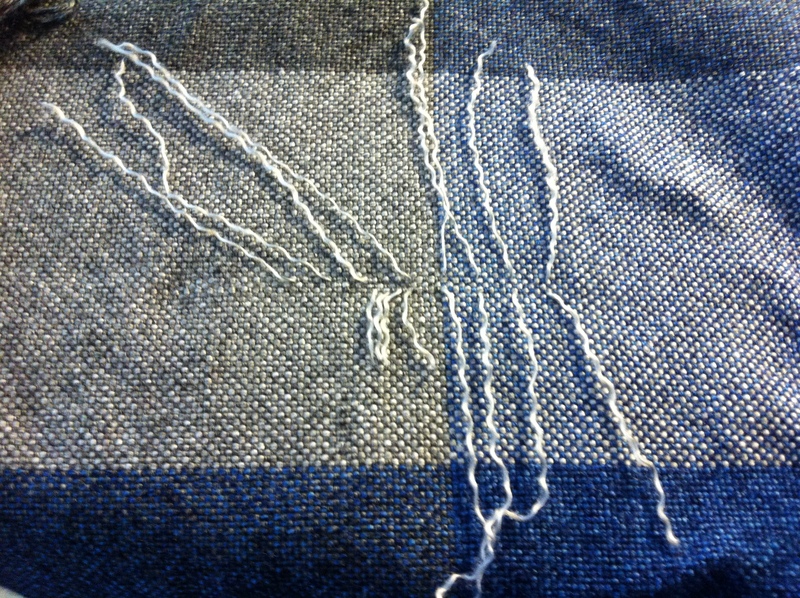 I spaced out the threading over 4 shafts for minimal caught threads during the weaving. Unfortunately, I didn’t record the threading, but I think it was 1-2 for the top layer and 6-8 for the bottom layer. Something like that. I added two warps of fishing line at the fold edge, each weighted with 2 pounds. (I warped one regular thread between the two fishing line warps, which was a mistake, because that thread kept getting caught between the fishing line. Lesson learned.) DP Dan set up a mirror on a stand so I could check the shed for caught threads, which really helped. Here’s my first color change! 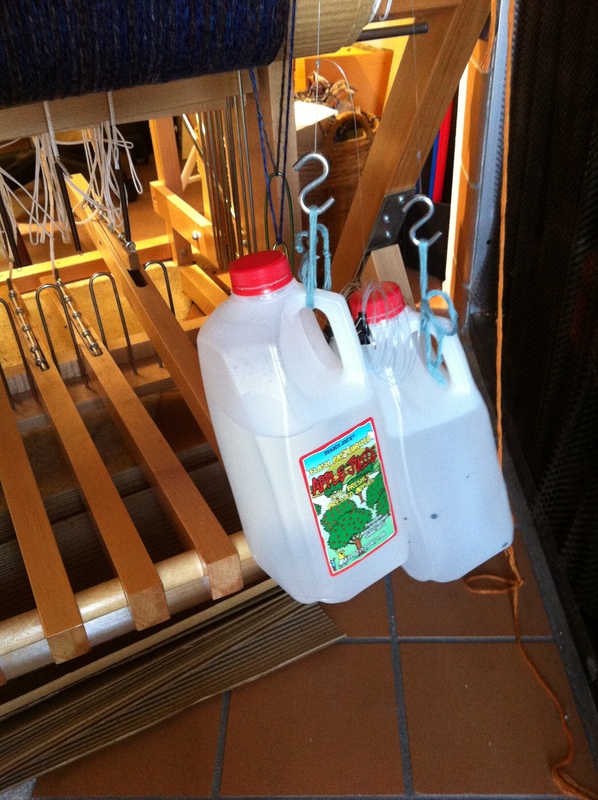 The weaving went fairly quickly – a couple of weeks. There was a little draw-in as I went along, but I figured it was not so much that it would matter, probably. 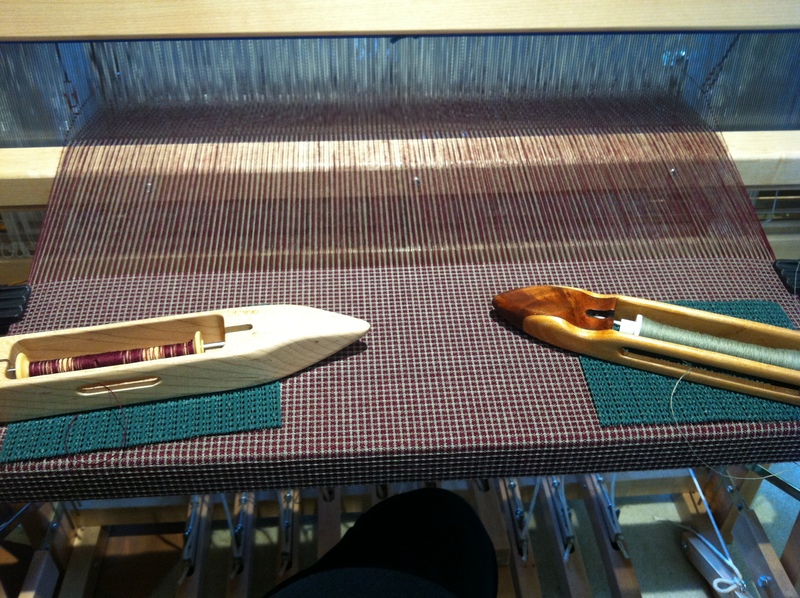 To keep the top and bottom of the free edge even over the breast beam, I just pulled the top layer so the stripe edges matched every time I advanced the warp. 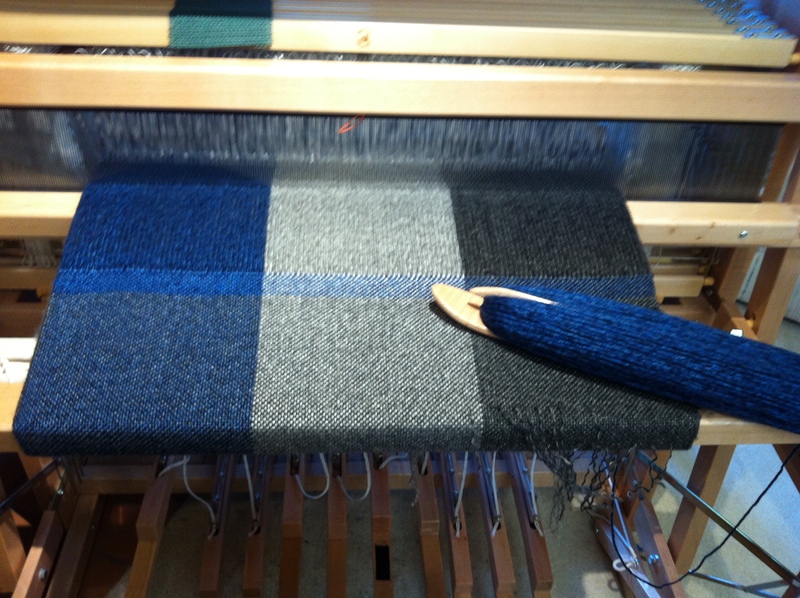 I also snugged the weft in at both selvedges with a finger between the layers before beating. These methods may not work with thinner or less forgiving yarn, and the bottom free selvedge was not great, but I just forged on! It was so beautiful, I wove until I couldn’t get in one more stripe, knowing it might turn out a little long. Taking it off the loom was an adventure. 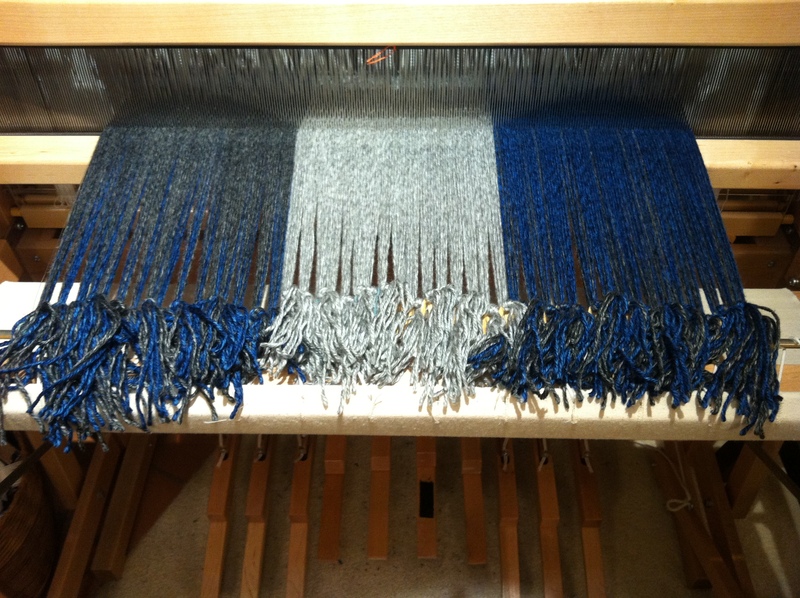 A weaving friend had not yet seen double-width, and was there for the experience. 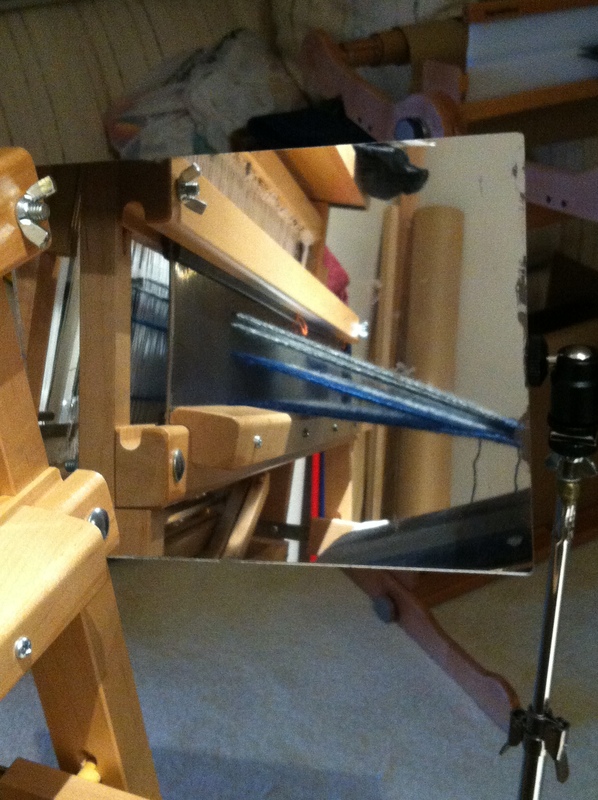 Magically (actually, thanks to the mirror), there were no caught threads between the layers!!! And, the fold turned out well enough. and then I just washed it in the machine – cold water, regular dry (lots of lint!). The wet finishing did soften the irregular bottom edge and the fold. I let this one sit for a few months, thinking it was too long and not the right ratio (96 x 44), and also too heavy for anyone to really want. However, it is too beautiful to shorten, and someone may love its soft coziness.